Based on texts mainly drawn from the books of First and Second Kings, Robert Leslie Homes' finely honed sermons focus on the ministries of the prophets Elijah, Elisha, and Amos. Through the stories of the prophets, Holmes addresses the unchanging theme of the gospel: that God loves the world and gave his Son, the King of kings, to save it. Packed with enlightening illustrations, these nourishing messages will help generate ideas for preaching and enrich the faith of all who read them. "I highly commend to you these sermons by Leslie Holmes. They are well crafted and biblical. His quotations and illustrations will be particularly helpful "
"This is a book for preachers, presented as sermons with many texts but a single message -- namely, God's love manifested in Jesus Christ. The author clearly understands that our primary task as preachers is to educate the people of God in the spirit and power of John 3:16 for ministries in a changing world. Our mission is to be faithful to God's mission of love and forgiveness demonstrated by Jesus. That is the challenge that Holmes brings to readers." 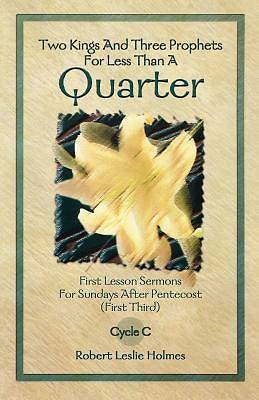 "Leslie Holmes has prepared a faithful and practical resource for preaching First and Second Kings. Whether or not the lectionary is used, his insight into these passages along with the illustrative material will prove valuable for the pulpit and the pew." A native of Belfast, Northern Ireland, Robert Leslie Holmes is currently Senior Minister at the First Presbyterian Church of Pittsburgh. He earned a B.A. degree from the University of Mobile (Alabama), his M.Div. degree from the Reformed Theological Seminary (Jackson, Mississippi), and a D.Min. degree from Columbia Theological Seminary (Decatur, Georgia), with post-doctoral studies at Princeton Theological Seminary, Fuller Theological Seminary, and New College (Edinburgh, Scotland). Holmes has preached and lectured on six continents and has spoken at conferences and churches throughout the United States and Canada.